The Birmingham Business Alliance (BBA) is inviting companies to participate in the Magic City Classic Talent Recruitment Project from 8:30 a.m. to 2:30 p.m. on Friday, October 28, at the Forum Building in downtown Birmingham. The BBA will be welcoming top talent to Birmingham in conjunction with the annual Magic City Classic football game between Alabama A&M and Alabama State University. It is the largest HBCU football classic game in the nation and a great BBA resource to assist Birmingham employers in efforts to recruit diverse talent. Participants will be college sophomores, juniors or seniors with business or STEM-related majors that have at least a 3.0 GPA and students that have completed professional development training with their campus career services department. 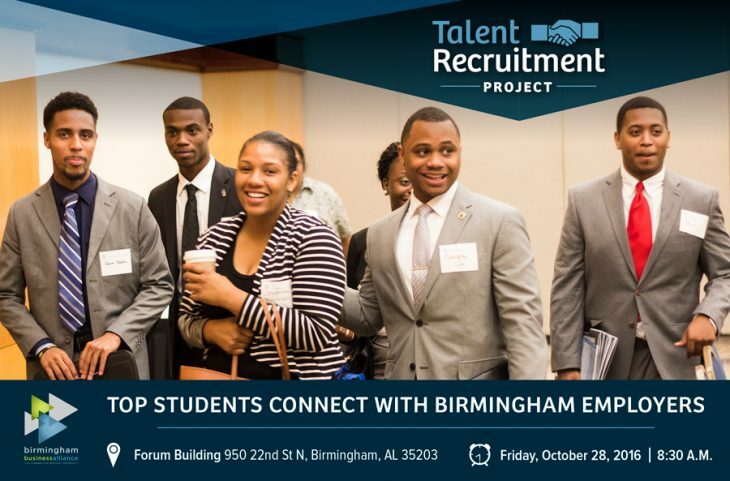 “The BBA’s Talent Recruitment Project offers valuable opportunities for students to connect with Birmingham employers within settings that allow for comfortable, yet professional networking,” said Desland Robinson, director of career services at the University of Alabama at Birmingham School of Engineering, who participated last year. There are currently 12 colleges signed up to participate including Alabama A&M University, Alabama State University, University of Alabama at Birmingham, Auburn University, University of Alabama at Huntsville and the University of Montevallo. Register here or contact Brittney Smith for more information on how your company can get involved. The deadline to register is October 17.